Recently one of our users asked us if it was possible to detect and display individual visitors’ IP address in WordPress. Our answer was of course it is. In this article, we will show you how to display user’s IP address in WordPress. You can use this to create your own IP detection site. 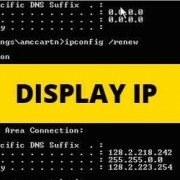 This way when a website visitor views your site, they can see their own IP address. All you have to do is paste the following snippet in your theme’s functions.php file or in a site-specific plugin. Next thing you need to do is add the following shortcode in your post, page, or in a sidebar widget. If you’re using the shortcode in your sidebar text widget, and it is not working, then you need to make sure that you enable shortcode for sidebar widgets. We hope this article helped you display user’s IP address in your WordPress site. If you have any questions or feedback, then please leave us a comment below. Great article! Is it also possible to show visitors country? That would require some advanced php or a plugin, we don’t have a recommended method at the moment. unfortunately there is still a weakness of the function, that is the problem of “cache”. visitors will see the same ip address (even if the router is restarted) when they are not clearing “cache” in the browser. Is there a way to display the user’s country flag with this code? How about a city or state instead of IP? Where can I see the IP’s collected? and should I paste the snippet of the code on the top of my function.php code? Paste the code at the bottom of your functions.php file. You will have to use shortcode [show_ip] inside a text widget. See our guide on how to add and use widgets in WordPress. I am from Germany and I am not a computer freak. But I have the job to find out of the client IP (out of Google Analytics) the Company of the visiter. Can you help me? This works great, thank you! Is there any way to have it also display the hostname, perhaps with a separate shortcode? Is it possible to obtain the IP of a previous blog visitor trough this method? If not are you aware of any other courses of action I can take? Also will I be able to access code if I do not have a premium wordpress account? I have been trying to locate the IP of an anonymous twitter troll and would really appreciate some help! Thanks for the tutorial. Please excuse if this is a dumb question but I’m new to working with WordPress. If I want to store the visitors IP address along with the date and time they visited a post, should I create a separate mysql database table or is there an existing wp table that collects this information that I can retrieve? WordPress only stores vistor’s information in the database if they decide to leave a comment. You can create a separate database to collect this information if you want. Creating a table for such functionality in WordPress is not an efficient move. I would prefer to do this using custom post type. Thanks for this, works fine. But is it possible to use this to monitor new user subscriptions? Thank you so much…. it works fine……..
@pippin you are correct. Your code worked fine, but wpbeginner’s code was also working fine. Display it where? I don’t understand the post at all. It should probably be noted that $_SERVER[‘REMOTE_ADDR’] will not always retrieve the IP properly. If the user is on a shared connection, you will need to use $_SERVER[‘HTTP_X_FORWARDED_FOR’]. If the user is behind a proxy, you will need to use $_SERVER[‘HTTP_X_FORWARDED_FOR’]. The IP can also be present in $_SERVER[‘HTTP_CLIENT_IP’]. Thanks Pippin, we have updated the article. Always worth noting that although you can read the IP address with PHP that it may not be useful because people have shared IP addresses, dynamic IP, access websites from different networks/locations and because it is possible to fake the IP address that PHP sees. So – only use an IP address with caution.